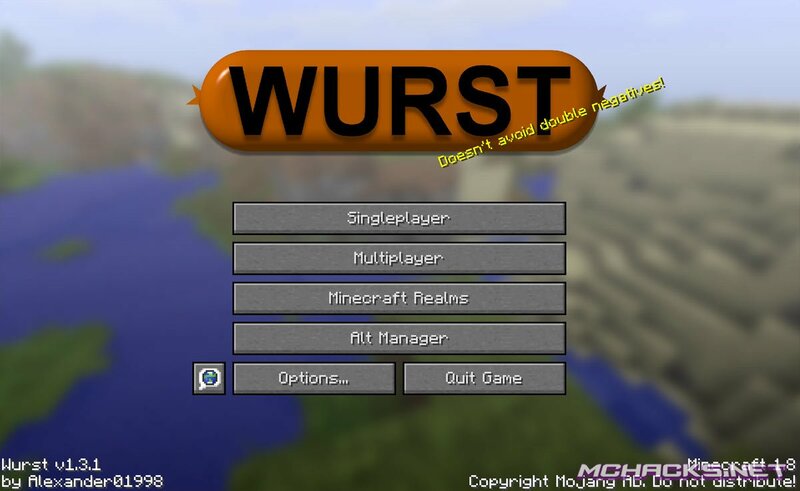 One of our favorite Minecraft hacks has been updated yet again, it is the Wurst client and it is now updated to version 2.19. This version sadly does not include support for Minecraft 1.9, but we hope to see this update sooner or later. AutoLeave is a mod that automatically makes you leave the server when, your health is low. This is useful in PvP, as it makes it very hard for other players to kill you. It used to have only two modes: Chars and Quit. The “Chars mode” sends a chat message containing the “§” character. This causes the server to kick you, with the message “Illegal characters in chat”. “Quit mode” is basically the same as pushing the “Disconnect” button in the menu. The reason this mode exists, is because some servers have a plugin called CombatLog, that is supposed to prevent people from disconnecting in the middle of a fight. Whenever this plugin detects that you leave the server in combat, it either clears your inventory once you come back or kills you. The trick is that this plugin only kills players if they manually leave the server (disconnect), but not if they get kicked. Some servers have better plugins that know about the “§” character, but they won’t kill you if you get kicked for other reasons. That is why we now have two more modes in AutoLeave: SelfHurt mode and TP mode. “SelfHurt mode” will make you try to attack yourself, which is not possible. This will cause anyserver to kick you, even with NoCheat+ plugin. “TP mode” will teleport you to a position that does not exist and this will cause the server to kick you. This does not bypass NoCheat+ though. Most servers, will normally kick you if you fly for more than 3-4 seconds. The server would send you a message saying “Flying is not enabled on this server”, and then interrupt the connection. In previous Wurst versions, you would have to go back to the ground at least once every 4 seconds to prevent this from happening. From now on, with the new bypass, you will no longer have to worry about that. Flight and Jetpack will now have a checkbox that when checked, will prevent the server from kicking you for flying. As long as you don’t fly more than 300m above ground and the server does not have MAC or NoCheat+, you can fly as long as you want without getting kicked. Note that this checkbox is not checked by default. Make sure that you turn it on, before trying it out.